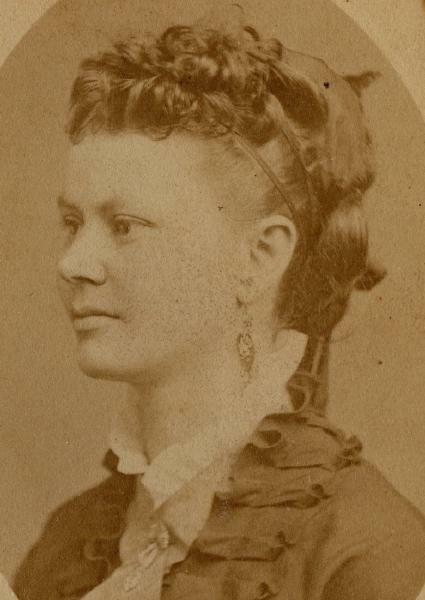 Ermina Augusta Johnson was born in 1849 in Michigan. She was known as Augusta. Orange Johnson and Hannah Hixon appeared in the US federal census of 1 June 1850 in Eaton County, Michigan. Other members of the household included Ermina Augusta Johnson, Clemena A. Johnson. Orange Johnson and Hannah Hixon appeared in the US federal census of 1 June 1860 in Oneida, Eaton County, Michigan. Other members of the household included Ermina Augusta Johnson, Clemena A. Johnson, Truman Johnson, Ida Johnson and Loren Johnson. Orange Johnson and Hannah Hixon, appeared in the US federal census of 1 June 1870 in Oneida Township, Eaton County, Michigan. Other members of the household included Ermina Augusta Johnson, Truman Johnson, Ida Johnson and Ada Johnson. She married Merritt R. Benchley, son of Nathan Benchley and Mary L. (? ), say 1878. Mrs. M. R. Benchley of Dale, New York, was a granddaughter. Ermina Augusta Johnson became a widow at the 21 April 1925 death of her husband Merritt R. Benchley. Ermina Augusta Johnson died on 21 April 1939. She was interred at Dale Cemetery, Middlebury, Wyoming County, New York.